One of the more unexpected names circulated around on the shortlist for the director of the new 'Star Wars' film was Colin Trevorrow. Unexpected for those who hadn't seen his debut feature, 'Safety Not Guaranteed' - its unique blend of character-driven sci-fi and romantic comedy wowed audiences at the Sundance London Festival and during its US release earlier this year. Darius (Aubrey Plaza) is an intern at a Seattle magazine, disillusioned and unhappy, yet persevering nonetheless. She seizes the opportunity to go on a work trip to investigate the author of a classified ad, who seeks a companion to travel back in time. Darius is accompanied by staff writer Jeff (Jake Johnson), who is more interested in rekindling an old romance, and fellow intern Arnau (Karan Soni), who is treating the trip as little more than a box-ticking exercise. She meets paranoid oddball Kenneth (Mark Duplass), who placed the ad and claims to have built a time machine. As the two spend more time together, they connect and Kenneth's claims begin to seem less outlandish than they initially appeared. Soon, the road trip has profound effects on the trio of journalists and their subject, Kenneth. Quite bizarrely, 'Safety Not Guaranteed' is based on a true story. In 1997, writer John Silviera placed an ad in Backwoods Home Magazine outlining his need to find someone to accompany him back in time. In Silviera's case however, it was quite obviously a joke. 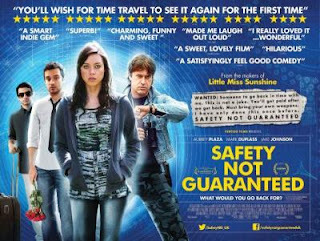 The hook of 'Safety Not Guaranteed' is the increasing ambiguity of Kenneth's claims, and the reasoning behind his wish to travel back in time. This is the hook that not only ensnares the viewer but also Darius, who has her own reasons to go back in time - the duo find solace in hoping for a better past. The tender nature of their relationship is magnificently teased out slowly by Colin Trevorrow, while the tone of Derek Connolly's fantastic script transitions superbly between romance, comedy and drama. The sci-fi premise may be off-putting to some but it plays a bit part amid the charm and heart, embodied by the film's central characters. Duplass and Plaza are especially terrific but each of the main characters moves out of the expected quirky comedy tropes and into something much more sincere and heartfelt. Indie filmmaking at its finest, 'Safety Not Guaranteed' is one of this year's best films full stop. 'Safety Not Guaranteed' is out in UK cinemas from today, through Vertigo Films.